I’ve heard him say it more than once. 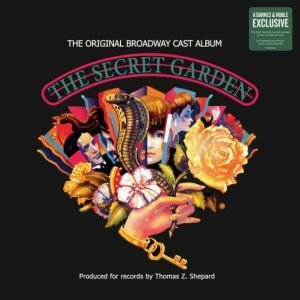 has just received its first vinyl release: THE SECRET GARDEN. placed them on the recording. has left her an orphan. recovered from her death, has jurisdiction over Mary. shoulder the size of Big Ben. Hear how expert eleven-year old Daisy Eagan played this little shrew. and not even ones in disguise. 5: Mary meets caretaker Ben who speaks of Lily’s beloved garden. looking for it until she finds it. assistant. He gives her an inadvertent hint on the garden’s location. character’s favorite adjective is “wick,” a synonym for splendid. a wick job in each of his five cuts. would like “toys, books or dolls.” He’s surprised when she instead requests “a bit of earth” to create a garden. Because Mary has that in common with Lily, she’s found a key to Archibald’s long-locked heart. Archibald’s equally reclusive young son who rarely leaves his sickbed. So that’s where those eerie sounds have been coming from! need to state it. Thus he had Mary add “There it is! There’s the door! course the recording’s main event. Crying” you’ll know he’s in great voice and you’re in great hands. between Mary and the woman that, in fact, they both loved. (And they don’t come any warmer than Rebecca Luker). Shepard has also often expressed a fondness for sound effects. made certain to add a robin’s chirping and a storm’s arrival. the year on www.broadwayradio.com .